There is a whole new AXELOS text requiring new PRINCE2 2017 training materials. 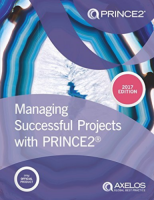 Our consultants reviewed drafts of the revised 2017 edition of Managing Successful Projects with PRINCE2 well in advance of its publication. We therefore have a lengthy familiarity with the new material. This is not an update of existing PRINCE2 training material. We have created this material fresh and structured it around the updated and revised manual. Therefore learning is focused not only on the long standing pillars of PRINCE2 but also on the revised mindset around tailoring. Click here to appreciate the purpose and extent of changes made by AXELOS to the manual. We have taken a modular approach to developing the training materials which means ATOs can structure the courses in their own unique way. There is a module for each chapter and each module follows the order in the book. Consequently, delegates are able to easily relate the slides to the text. Furthermore, it will be a simple matter for trainers to remove Practitioner material to create courses directed at Foundation level candidates. Slides are uncluttered and include suggested images for ATOs. Most importantly, the modules come with extensive trainer notes ensuring that all parts of the syllabi are covered. This in turn makes the course more engaging for delegates. Key points are on the slides with supporting detail supplied by the facilitator. Hence both visual and auditory cognition is engaged. The course is available for outright purchase. Licensing arrangements can be negotiated.